Heat oven to 375°F. Spray cookie sheets with nonstick cooking spray. In large bowl, combine sugar, brown sugar and margarine; beat until light and fluffy. Add vanilla and egg; blend well. Add flour, baking soda, cinnamon and salt; mix well. Stir in oats, raisins and nuts. Drop dough by rounded teaspoonfuls 2 inches apart onto sprayed cookie sheets. Bake at 375°F. for 7 to 10 minutes or until edges are light golden brown. Cool 1 minute; remove from cookie sheets. Use old-fashioned rolled oats instead of quick-cooking rolled oats. Instead of raisins, use your favorite dried fruit. Try dried apricots, blueberries, cherries, cranberries, chopped dates or figs, or mixed fruit bits. Oatmeal cookies freeze well. Transfer the cooled cookies to airtight containers and freeze them for up to six months. For grab-and-go desserts and snacks freeze two or three cookies each in resealable plastic freezer storage bags. Soft, chewy, lightly spiced oatmeal cookies taste just like coming home. 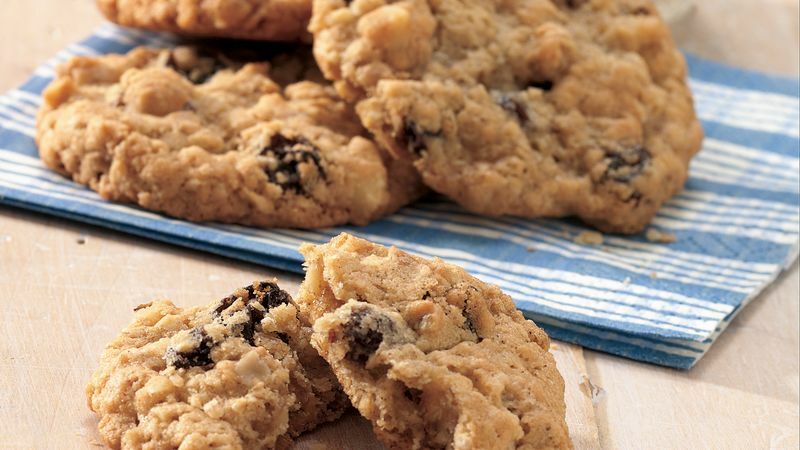 The sweetness of brown sugar paired with the nutty flavor of oats creates a cookie that’s almost impossible to resist. (Plus, you can tell yourself you made a healthy choice because oats are packed with whole grains and fiber!) They’ve been a popular sweet treat in the United States ever since one of the original recipes appeared on the Quaker Oats can in the early 1900s. Oatmeal cookies are delicious on their own, but it’s so easy to take them to the next level. Try toasting your oats on a baking sheet for about 20 minutes before mixing them into this recipe. Walnuts and pecans add a nice crunch to the chewy texture of the cookie. For chocolate lovers, add chocolate chips or M&Ms to the mixture before baking. Finally, add raisins—or don’t, we’re not here to tell you how to live your life. Need more awesome oatmeal cookie ideas? Look no further! Want to save that batch for later? Layer cookies between parchment paper and store in an airtight container. Freeze for up to 12 months and thaw at room temperature when you’re ready to eat! Our easy how-to guide has even more tips and tricks to ensure cookie success.